Beautifully straight teeth look great, feel even better, and they also help lower your chances of developing cavities and gum disease! What’s not to love? Now, at Texas Tiny Teeth Pediatric Dentistry & Orthodontics, both you and your children can get the orthodontic treatment you need in either our Greenville or Frisco location. Our orthdontist can help children and parents alike with a multitude of teeth/jaw alignment issues without sending you running around town to different offices. At Texas Tiny Teeth Pediatric Dentistry & Orthodontics, we are proud to offer all types of braces to our valued patients. These orthodontic services are reliable, durable, and cost-effective – they be used to treat simple and complex smile needs alike! 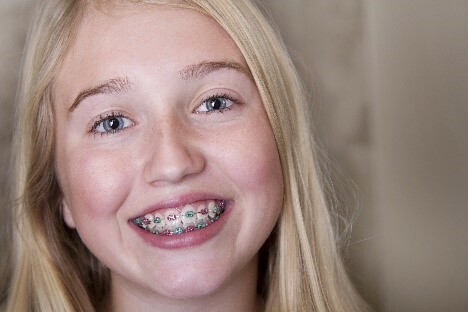 Metal braces are the most common type of orthodontic treatment for younger patients. They use brackets and orthodontic wires to place gentle but consistent pressure on the teeth, gradually bringing them into the proper alignment over a period of time. Today’s modern braces are smaller, flatter, and much subtler than their clunky counterparts, which means our patients can keep smiling confidently throughout treatment. If your family would like to explore alternatives to traditional braces, our team would be happy to tell you all about them. Increased Confidence: Perfectly straight teeth are simply great to look at, and they’re even better to show off when they’re your own! After orthodontic treatment, a patient always feels much better about their smile’s appearance, giving them the confidence to pursue their life goals with more energy than ever. Better Function: When the teeth and/or jaw are misaligned, they can make even the simplest things like eating, speaking, and smiling feel uncomfortable or cause pain. Braces can easily correct a multitude of issues to restore normal function so that the last thing people have to worry about is their teeth. Improved Oral Health: Remember that thing we said about cavities at the top of this page? It’s true! When the teeth are bunched together, this can create small spaces where plaque can gather that are also extremely hard to clean. By lining the teeth up properly, a patient is able to get more out of their brushing/flossing routine, therefore reducing their chances for the most common dental problems. The answer to this question varies from individual to individual. For those with only a few misaligned teeth, final results can often be achieved in as little as 12 months. However, for someone with more complicated problems, treatment can take one to three years. Our doctors can let you know how long your treatment time will be at your initial consultation. If you’re interested in getting braces for either yourself or your child, all you need to do to get started is schedule an appointment at Texas Tiny Teeth Pediatric Dentistry & Orthodontics. You’ll meet with our orthodontist, they’ll perform a comprehensive exam, and then he’ll let you know if you or your child are a good candidate for orthodontics. From there, he’ll answer any questions you might have, and then our team will work with you to find a financial plan that helps your treatment fit easily into your budget. To learn more about our orthodontic treatments and how we can use them to help you, contact us today.